The North Wirral Velo’s first meeting of the bicycle Maintenance And Repair Section (MARS… see what I did there?) was well attended last week. Led by club dad Michael Hurworth, the group went through the basic “M” check that all riders taking to the road should do on a regular basis. The M Safety Check List for your bike is a nose to tail series of checks that follow the form of the letter M. Most checks should be carried out prior to any ride but especially a club ride to ensure not only your own safety but that of the others you are riding with. If you are riding more than 100 miles per week then all checks should be carried out at least once per week, this can be done as part of your cleaning and maintenance routine. Like all repetitive tasks, the more you carry the task out the faster and more proficient that you become at completing the task so this should not be seen as a chore but rather as a demonstration of concern for your own and fellow riders safety and well being. The beauty of this method of checking your bike is that the only thing you have to remember is the M, you methodically follow the letter (or imaginary orange lines!) checking everything that you come across. No part of the M-check is very technical, you are looking for obvious signs of damage or wear so don’t worry or overcomplicate it. In this first instalment I shall list the 25 checks* that should be carried out with a basic instructions on what to check and how to perform the check, more detailed instructions for the more complicated adjustment processes will be provided as a separate topic at a later date. Front Quick Release Skewer – Quick-releases must be firmly closed and the lever not exposed. Hub Bearings – Grasp each rim and rock it from side to side to check for play in the bearings. Front Wheel Spokes – Check al the spokes for tension by flexing them in pairs. Front Rim – Spin the wheel to check that the rim is true and centred in the forks. Check the Rim Wear Indicator on bikes with rim brakes. Front Tyre – Check the tyre pressure and adjust to manufacturer recommended pressure. Ensure the valve is closed and the dust cap is secure. Check the Tread Wear Indicator (TWI if the manufacturer provides). Check the tyre walls for splits. Front Brake (Calliper or Disc) – Apply the front brake. Brakes must make contact with the rim before the lever is pulled back more than one third of its travel. Ensure that the brake blocks/pads are not rubbing on the rim/disc when the brake is not applied. Check the blocks/pads are not excessively worn. Adjust or replace if required. Check for any signs of wear or fraying to the cable, or excessive “sponginess” if hydraulic. Front Forks – Check for any damage to the front forks. Headset – Check if there is any rocking or clicking in the headset. Grasp the head tube with one hand and apply the front brake with the other hand. This will steady the front of the bike so that you can rock the bike back and forth to establish any rocking or clicking in the bearings. Adjust if required. Handlebars – Check that your front wheel and stem do not move independently, and that your handlebar clamp bolts are tight. Perform this check by standing in front of the bike, holding the front wheel between your knees, and twisting the handlebars. You can prevent any movement by tightening the stem bolts and the handlebar clamp with a torque wrench tightening to the recommend torque setting. Bottom Bracket – Check by trying to rock the cranks from side to side to see if there is any play in the bearings. Crankset – Check that both crack arms are tight on the bottom bracket axle. Chain Rings – Check for loose bolts, that the rings run true and for any wear on teeth. Pedals – Check that the pedals are complete: no missing screws, no excessive wear. Check they are fastened tightly to the cranks. Front Dérailleur – Check that the gears shift correctly between the chain rings. Adjust if required. Check for any signs of wear or fraying to the cable. 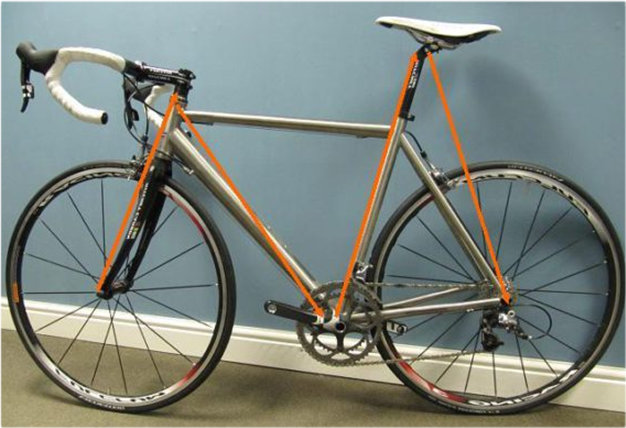 Frame Triangle – Check the frame triangle looking for obvious defects including wrinkled paint around where the top tube and down tube meet the head tube. Seat Post Pin – Check that the pin is secured and adjusted to the correct torque setting. Saddle – Grasp each end of the saddle and try and rock it. It should not move, either up and down or side to side and it should be in line with the top tube. Rear Brake (Calliper or Disc) – Apply the rear brake. Brakes must make contact with the rim before the lever is pulled back more than one third of its travel. Ensure that the brake blocks/pads are not rubbing on the rim/disc when the brake is not applied. Check the blocks/pads are not excessively worn. Adjust or replace if required. Check for any signs of wear or fraying to the cable, or excessive “sponginess” if hydraulic. Rear Tyre – Check the tyre pressure and adjust to manufacturer recommended pressure. Ensure the valve is closed and the dust cap is secure. Check the Tread Wear Indicator (TWI if the manufacturer provides). Check the tyre walls for splits. Rear Rim – Spin the wheel to check that the rim is true and centred in the forks. Check the Rim Wear Indicator on bikes with rim brakes. Rear Wheel Spokes – Check al the spokes for tension by flexing them in pairs. Rear Hub Bearings – Grasp each rim and rock it from side to side to check for play in the bearings. Rear Quick Release Skewer – Quick-releases must be firmly closed and the lever not exposed. Rear Triangle – Check for any damage to the rear chain stays and seat stays (the rear triangle of the frame). Rear Derailleur – Check that the gears shift correctly up and down the cassette when in either of the chain rings. Adjust if required. Check for any signs of wear or fraying to the cable. *This list is for guidance only. If you have any doubt as to the condition or performance of any part of your bike and don’t know how to fix/replace it, please seek professional help from your local bike shop, or find a local cycle club with a wealth of cycling knowledge and experience to join and ask the club dad. Please get in touch to learn more about the club and meetings. After another frustrating trip to Halfords the bike is loaded on the car and kit is being packed for my first road race. All the usual kit questions go through my mind, skinsuit, winter gear, jersey, shorts, tights, whatever happened to those baggy shorts I regularly ask myself? Throw in whether i should use my new Velo coloured helmet or the trusty battle scarred one, prizm lenses in the glasses or photochromic, its enough to make a certain old pro shake his head in disgust or Rebekah (my Wife) for that matter. I decided to take all my summer kit and none of my winter kit for racing in March, yes I have made this mistake before. This time I had also managed to get the family involved to make a weekend of it so as well as packing my 2 course pre race breakfast I had to make room for luxuries, clothes, swimming costumes, barbies, children etc. Luckily for them the turbo folds pretty small otherwise toys would have been kept to a minimum. Finally after some M6 Friday afternoon action we get to the stonker of a hotel I have booked. Rebekah says I have finally realised what the required standards are and we are living large. Family stuff takes precedence over the next 24 hours with just an hour course recce for me on Saturday morning to see how flat and windy it’s going to be, very to both but I am happy. I also have to go and buy better gloves as it turns out Cockerham is bloody freezing and my fingers were numb after 1 lap never mind 4. This is one lesson I may never learn but there may be some good kit on offer every so often. Race day sees me up at 6am for my 2 course breakfast, Weetabix, Honey and Banana followed by Beans on Toast. I normally spread this over a whole morning pre race but with a 9am start time, needs must with me not trusting myself to mess with gels/bars mid race. I had to eat fast though as i was breaking the 3 hour digestion rule but prioritised sleep this time. I then chilled out until getting on the turbo at 7:20. Turns out a turbo and cleats on a wooden floor in a first storey apartment makes a fair bit of noise but hopefully the presumably delighted people downstairs thought it was just Rebekah walking around in high heels and doing the washing. Warm up done, sweat cleaned off the floor and i said bye to everyone and rolled down to Cockerham to meet ‘Mr I love a Puncture’ Will. The kids ran after me to give me one last hug as i was leaving and left me hoping their 6th sense was off and we didn’t need such a big goodbye but it was nice. It really helped having them there as it took away the guilt of missing time with them to race. After finding Will at HQ and his last minute puncture repair (And panic he had the short valve inner tubes for deep wheels) we got numbered up, completed warm ups, attended the riders briefing and were ushered into the starters pen – aka the car park for the rolling start. I was a little back after toilet stop 931 of the morning but spotted Will further up and managed to sneak in behind him. This was it, a rolling start behind a lead car with motorbikes and everything. I was properly racing and this was going to be great was what was going through my head as the peloton rolled down to the start! BOOM! We crossed the line and this got real! The rolling peloton became a surging animal, speed doubled, space shrank and there were bikes everywhere and my legs had disappeared. I spotted Will moving up through the peloton but I was fighting to hold on and slowly sliding backwards. All those thoughts yesterday doing the recce of possible attacking places were replaced with ‘I am getting dropped 5 mins into my first road race!’ A stern word with myself made me pull up the big boy lycra and I moved up the outside of the bunch with a calculated gamble on the white line to get into some sort of decent position that earned me some shouts from the ‘Mr Play by the rules whilst it suits’ crowd. I spotted Will and got in the wheels, realising I had to race smart. Sticking out in the wind had allowed me to move up but had cost a lot of energy. I needed to shelter or the wind would be sending me out the back. Whilst I had been realising this was a race a small break of 3 went and fair play to them as they impressively stayed away all day and smashed it. Halfway around the 12 mile lap we turned and had the first taste of the tailwind, now it would be cruising on the wind. Wrong again as the speed clocked up to 30mph. I was in the game now though and emptied myself when I needed and drafted to recoup energy when that was needed. I also spotted an ‘experienced’ rider drifting around the wheels and followed him and learnt a lot in the next 24 miles, unknowingly to him this was probably my best move all day. The last 3 miles of each lap contain the only lumps in the race with 3 small rises. Everyone was smashing into these and slowing greatly at the top but I kept cadence high and crested each, carrying good momentum through and conserving energy. This formed an ill advised plan in my head whilst we smashed through Cockerham and back into the headwind. Laps 2 and 3 went by pretty smoothly but were still hard work, sprinting, hiding, sprinting, hiding, little panicking and so on. Another small group of 4 got away but i was a little back at the time so unfortunately missed the break without being able to do much about it. By this time I felt like I belonged and I was really racing, even returning a few of the shouts I had been given out just because I could! The last lap had me battling to stay up near the front and I followed a few attacks but unfortunately nothing stuck so I finalised my plan for the hills. I was going to hold back slightly and attack over the top to get up near the front with my extra momentum. I knew I had to wait to at least halfway up the last as there was too much road and headwind to go earlier. My plan kind of worked but when it slowed someone completely blew in front of me and as I had not positioned on the outside I had nowhere to go, by the time I had got around the race was gone. I chased for a while but alone in the wind i was not catching the sprint. I sat up and watched the sprint for the line as sprinting for 30th place is not a cool look. Being in the mix for 7th for 49.5 miles will do for my first race though so I am happy. It was also great to share the experience with a fellow Velo racer. Having a coffee and cake ‘debrief’ (Told you i felt like a real cyclist!) with Will was great, talking all things bike and how the race had gone was a nice ending to the event. After the Time Trials with Robin has felt very similar and brings a real enjoyment and camaraderie into all the hard work. Looking back now my plan was pretty stupid as i have intervalled School Hill to death and hills are generally a strong point for me. I should have trusted my legs and the work i have put in to ensure i was always right up there and give myself a chance, that is one lesson i will learn! Overall feeling is that I am very happy, I was at the business end racing for top 10 for all the race, raced pretty smart, matched sprints and did alright. Work is needed to get really in the mix but I will do as much as I can and even if I don’t manage it I am really racing! A great weekend in a fantastic part of the world, I rode my bike really fast (50 miles at 24.3mph and also spent time with the family, PERFECT! Ride safe and if you fancy giving it a go be brave! I have also had to contend with a monsoon last week that due to poor clothing choices led to my hands going numb and 50mph winds this week. I can’t really explain my thought process in seeing the BBC weather warnings the night before that I thought the deep aero rims for the (Not so) Sunny Rhyl Cup were the correct call. Driving over the snow covered Halkyns at 7:30 on a Sunday morning to go racing also had me doubting my sanity. Truthfully I am disappointed in my 5th and 11th places but the step up to E/1/2/3 racing has been massive. I am definitely stronger but so is everyone else, coupled with me forgetting everything I learnt last year has led to 2 long training rides around the Marsh Tracks. As appealing as option 1 is and the fact I actually like the people in option 2 I will probably carry on as I am. I am Dave the Husband, Father and Engineer who cycles not a pro cyclist. The challenges will be successes at some point over the next few months and the sun will shine to make it more enjoyable when I do finish with the others. You never know I might even go for option 4. A few days off, have a lie in until 7:10, do a jigsaw with the kids and just visit the bike shop to keep my eye in. Cold turkey is no good for the body, shock and all that. By Wednesday I will be desperate to ride again and be convinced that i am the ‘greatest undiscovered talent’ in all of Moreton. I am also pretty pleased with myself for clapping loudest when the winners were being presented on the podium today, I was average but they were awesome! Stay safe and enjoy the ride! 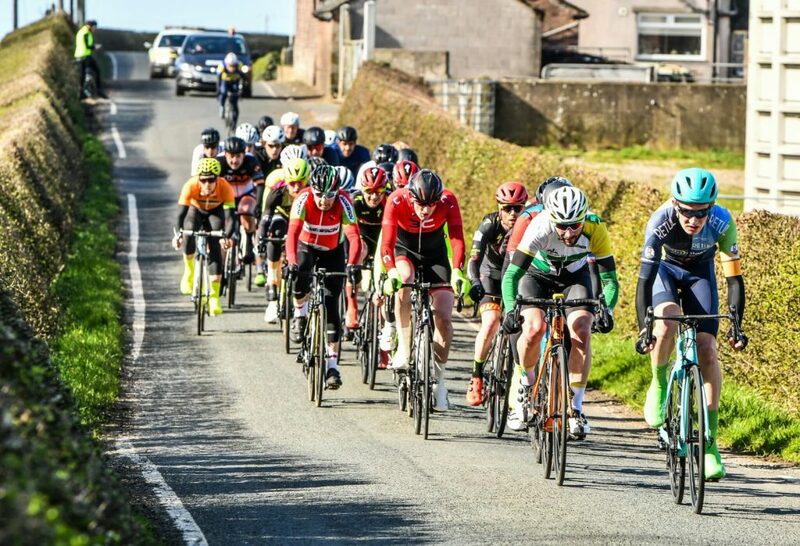 This weekend the Velo had 3 riders in the Chester Road Club hilly 14 mile time trial, near Broxton, Cheshire. Robin Hennessy, Dave Cuthill and Mike Stanley were in action on an unseasonably mild Feb afternoon. 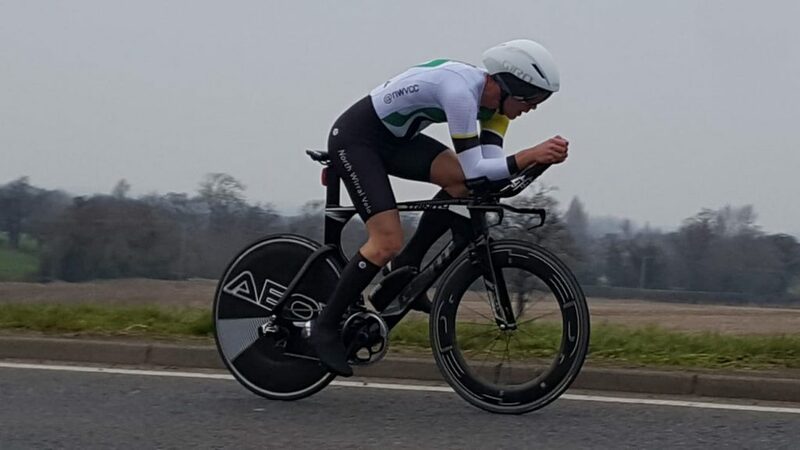 Dave was off first of the team and recorded a superb 33:49, good enough for 18th overall in the event, but more importantly a massive 3 minute improvement on last year. A winter of hard work is paying off! Next off was Robin, looking ever the pro, and got round in a blistering 32:38, which placed him 8th overall. He was closely followed by Mike who recorded a very respectable 36:39, a good 3 minutes better than his veterans standard time. Overall three great rides at the start of a great season to come! Thanks to the Chester RC for a brilliantly organised and run event. After a few months of training it was time to strap the new improved TT bike to the back of the Fiat 500 and head off to the dogging capital of the world, Broxton roundabout and its infamous car park. 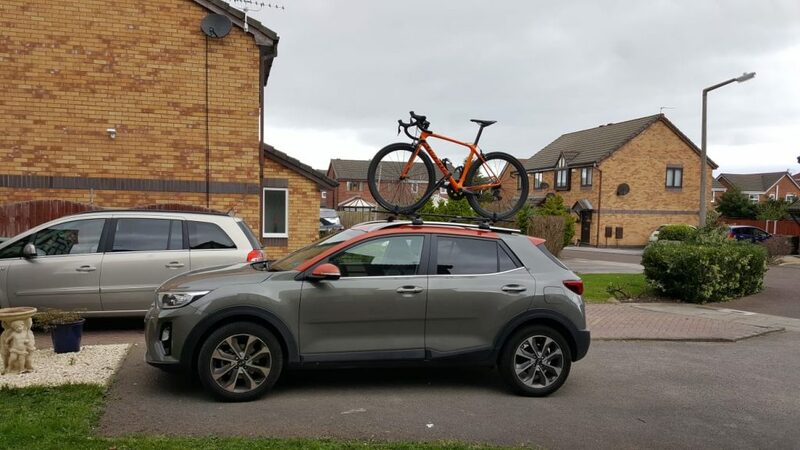 Robin pulled in 5 mins later (Also in a Fiat 500 – new team car?) in the tightest pair of jeans i have ever seen, I assumed the car park has a dress code I didn’t know about! Soon after we started our warm ups, my methodical approach compared to Robin rolling down the main road a couple of times. Each to their own and either way we were ready and set off with numbers 4 and 5 on our backs. The week leading up to this had seen me go through a number of emotions that racing gives you. I had planned in 2 practice runs on the same training runs I had done the previous year. The first was destroyed when after putting in a massive effort into a headwind i was stopped by traffic going for Sunday dinner. (FRUSTRATION) The second attempt nothing went wrong except me being slower than the previous year! (DESPAIR) Rebekah rightfully suggested this could be down to wind speed and many other variables but what did she know, I had wasted the last 4 months and that was that! The morning of the race was also a bit of a roller coaster. I woke up NERVOUS and ANXIOUS that i would be worse than last year. I was prepared, had worked hard, lost weight and improved all my equipment (Pointy helmet and everything!) but I still might actually be slower. However, this all changed when my 2 daughters surprised me with a good luck card they had secretly made. Below is my Facebook post that sums up this best, but fellow racers please remember this is meant to be FUN so ENJOY it and be happy for other people’s success! 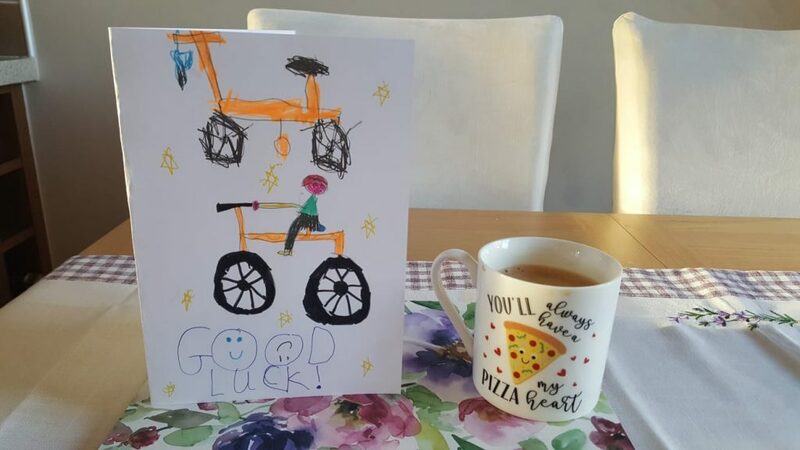 First day of the race season for me today and the girls surprised me with a card they sneakily made. It has taken me back a little as I do feel guilty missing time with them to train but it has also made me realise I have been working hard and it’s now time to just ‘enjoy’ it and whatever happens, happens. Good luck and stay safe to all the other racers. Stay safe, ride hard and don’t be afraid to step out of your comfort zone! As January grinds by we look forward to the season ahead, lighter nights and better weather. 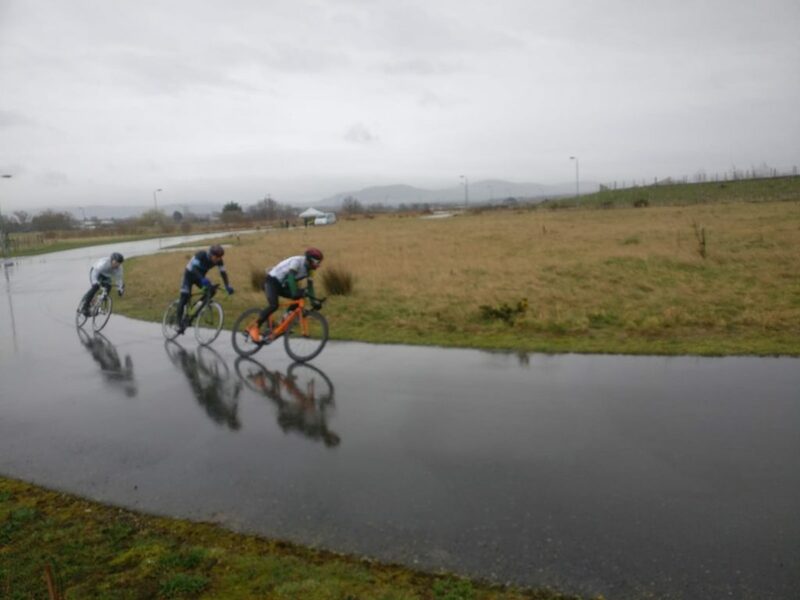 The North Wirral Velo’s racing team members have been working hard over the winter so far and are looking forward to the challenges the new racing year. Meanwhile the rest of the Velo are still enjoying themselves with a few pints and a curry! 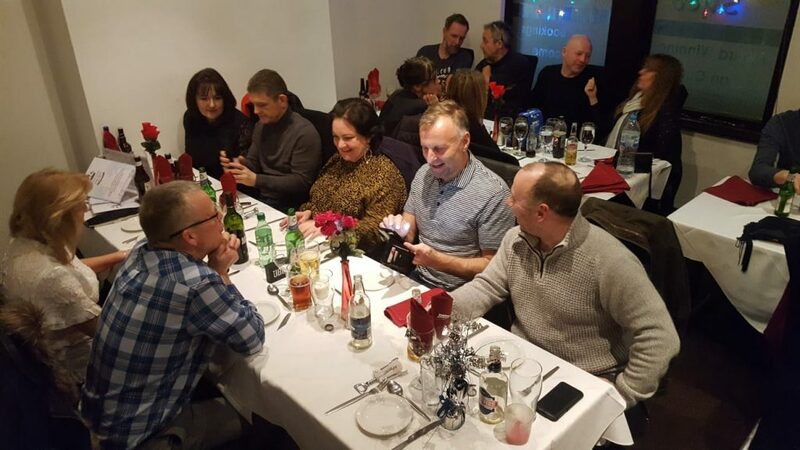 A very well supported and enjoyable evening was had at the Mak Syed in Wallasey Village. As well as putting the world to rights, plans were discussed for more club rides (and more social events). The end of January saw a club trip to the National Track Champs in Manchester. The first visit to the velodrome for some of the members, and the night was enjoyed by all. The club website has had an upgrade too. We have changed hosts to a more stable platform and we have added a forum and events calendar to help club organisation of rides and social events. 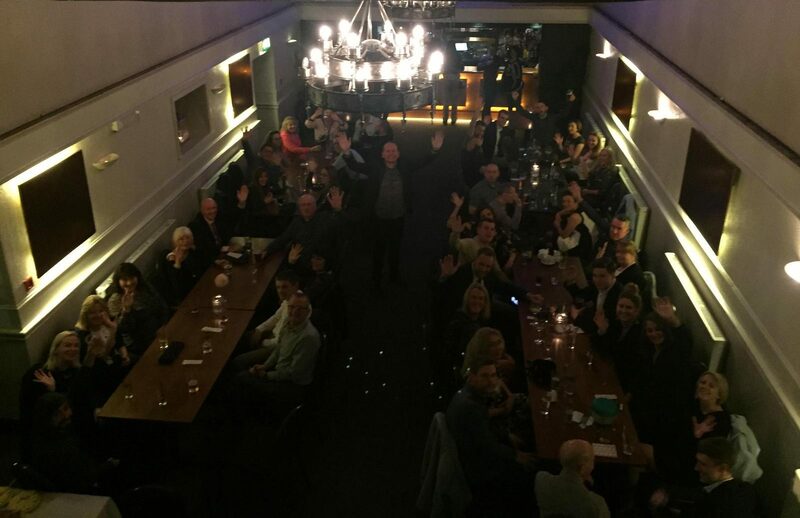 In summary, we are looking forward to the coming year, the racing, the riding, the socialising and the banter! If you want to join us, please email hello@nwvcycling.club for more info, or say hello when you see us out! A very merry Christmas to all! 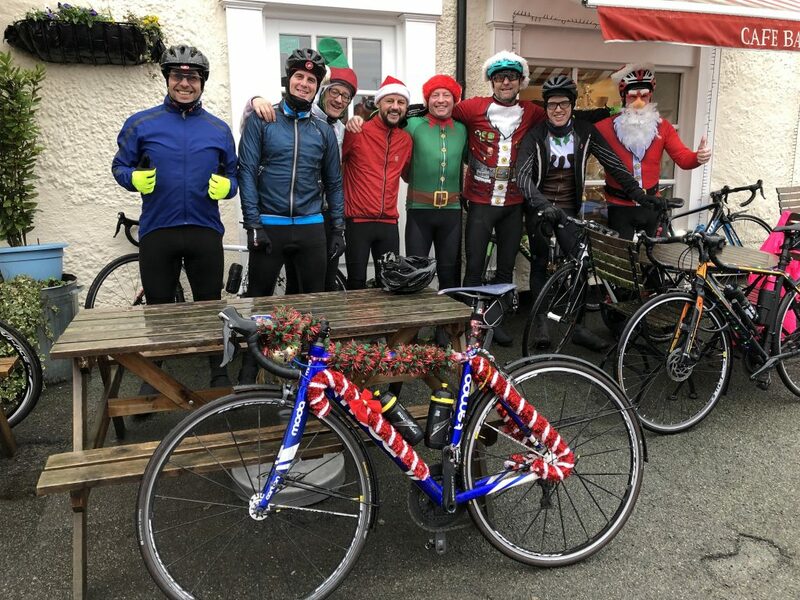 The North Wirral Velo hopes you all had a great Christmas and wishes you all a prosperous, safe and healthy New Year! Hope we see you out on the road in 2019! 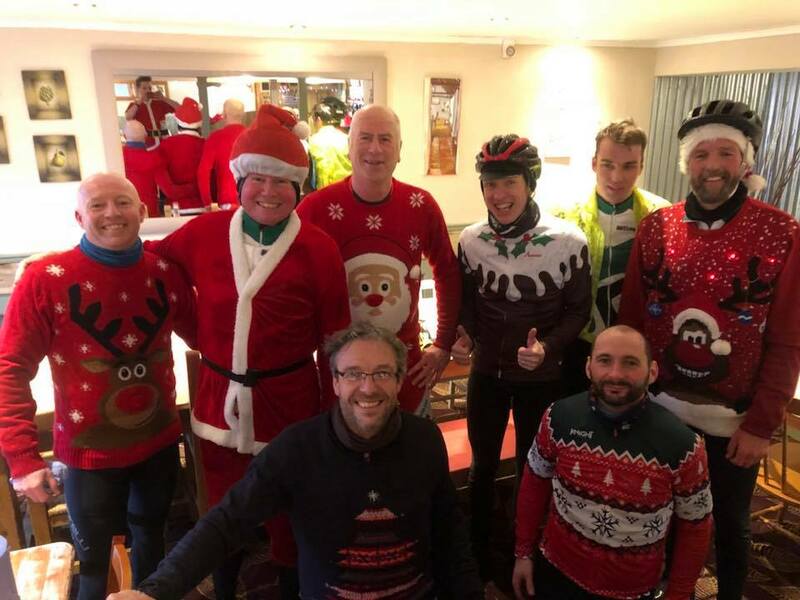 The annual NWV Christmas jumper ride returns this Sunday to one of our favourite cafe stops Cleopatras in Holt. We are hoping for an even bigger turn out and a lot better weather than last year! This year the competition for “Most Festive Effort” is also on and the winner, who will be determined by an independent panel of experts, will receive their coffee/cake/beans on for free! So, get decorating your bike, get on your best Christmas jumper and good luck for Sunday!